Anyone in a group photo knows about spatial information arrangement. To display who’s who, names are usually arranged by their place in the photo — left to right, in rows, clockwise. For photos, alphabetical order would require a location statement (third row, second from the left), so it’s a lot easier and more helpful to organize the names by spatial placement. Geography is a subset of spatial arrangement. Here information is listed by how it appears on the land. Written travel guides often organize the sights in the order in which tourists encounter them on the road. The guide might put a prominent attraction first, veering from geography for the sake of customer convenience. The authors know where the tourists are really heading, so they make things easier by incorporating order-of-importance into the spatial arrangement. the few remaining stretches of the Mother Road. “Route 66,” Bobby Troup’s hit song, maintains the east-west travelogue with one exception, “Gallup, New Mexico; Flagstaff, Arizona; don’t forget Winona.” Winona is east of Flagstaff so an accurate listing would be Gallup, Winona, and Flagstaff. Troup had an arrangement parameter that took precedence over the map. He needed a rhyme. For those lines, he returned eastward. Even so, Troup maintains geography, signaling a change in direction with “don’t forget Winona.” Then he heads west again to Kingman, Barstow, San Bernardino. travel my way; take the highway that’s the best. 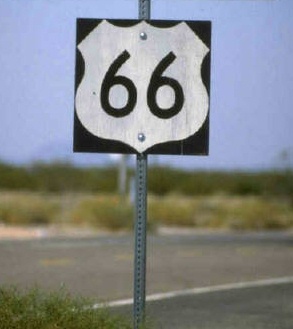 Get your kicks on Route Sixty Six! Bobby Troup, “Route 66” in The Great American Songbook: The Singers. Milwaukee, WI: Hal Leonard, 2007, pages 274-277. Today’s post honors Phillip Gibbs and James Green, killed shortly after midnight on May 15, 1970 by police at Jackson State College in Mississippi. On May 4 of that year, Allison Krause, Jeffrey Miller, Sandra Scheuer, and William Schroeder were killed by the Ohio National Guard at Kent State University. This post will also be the Memorial Day essay for Discover the Region, where some of my writings will now be published. Like all language, organized information persuades. It “directs our thinking,” as biologist Stephen Jay Gould wrote about classification. Information arrangement shapes perception and interaction. Names on memorials are examples of organized information where arrangement defines a visitor’s experience. The thoughtful chronology of the Vietnam Veterans Memorial builds a space for individual remembrance. A World War I memorial does the same, but with a different arrangement strategy, reflecting the difference in the two wars. In contrast, the random arrangement proposed for the World Trade Center memorial almost derailed the project. Yet, in another context, random builds community at the Memorial Temples of Burning Man. Architect EdwinLutyens influenced Lin with his World War I Memorial to the Missing of the Somme. This open structure of 16 huge columns, with intersecting arches and a truncated tower in Thiepval, France lists more than 72,000 names on its huge columns, names of British soldiers missing from a single battle. Like the VVM, the memorial gives survivors an individual place of remembrance, but the two use different arrangements to achieve the same goal. The VVM honors over 58,000 dead or missing during a 20 year war. The Somme memorial lists those missing from a five month battle, most from a one day massacre when British troops surged into waiting German lines. Michael Arad, designer of New York’s National September 11 Memorial, ignored individual places of remembrance when he selected random as the arrangement. This would have dispersed names from each company all over the monument. Instead of a personal place to remember fallen coworkers, survivors would have had to hike to see each name. The arrangement infuriated surviving families and they eventually refused to contribute to the memorial fund. At that point, the design committee reconsidered and offered “meaningful adjacencies.” Families can now place their loved one’s name within a group or next to an individual. Many names will appear with the companies they worked for, but they might also be with special friends. In one case, a married couple who worked at different companies will now be forever together on the memorial. In the right context, however, even random can build private spaces of remembrance. David Best did this at Nevada’s Burning Man art festivals. His Memorial Temples in 2001, 2002, 2003, and 2004 reflect the Somme memorial as arched open structures, topped with a tower and filled with names. Burners inscribe the names they want to remember anywhere on the memorial. The effect is random, but each inscription describes a private remembrance. For the week of the festival, Burners have a personal place to grieve, a place they have chosen. When the Temple burns on Sunday, individual memories and the combined memories of all Burners float into the evening sky. Umberto Eco’s four month Louvre exhibit about lists finished its run in February. So if you want to see his “Mille e tre,” exhibit, you’ll have to get the beautiful catalog, The Infinity of Lists, with essays by Eco about the history of lists, along with examples of literary lists and photos of lists in visual art. One shows a painting of edible vegetation combined to make a realistic human face with a zucchini nose (p. 130). Following the trail of Eco’s footnotes, I found a delightful book about literary lists by Robert E. Belknap, The List: The Uses and Pleasures of Cataloguing. Belknap distinguishes between literary lists and pragmatic lists, the type usually made by my readers. We expect creativity in literature and lists are no exception. Here’s an example from Tom Sawyer identifying the contents of Tom’s pockets as “a lump of chalk, an indiarubber ball, three fish hooks, and one of that kind of marbles known as a ‘sure ‘nough crystal’” (Belknap, p. 17). Belknap shows how Twain’s language enhances each object, with the marble given “the privileged, anchoring, final spot” (p. 18). We don’t usually think of pragmatic lists as creative. Yet they are composed of words and any use of words has a creative component. Just think about placement, which Twain used for the marble. In a pragmatic list, the first item holds the privileged spot. First place may be anointed through an accident of the alphabet. It might also be an example of what Belknap calls deliberate arrangement. Even in alphabetical lists, first place can be deliberate. Words have synonyms and some of those synonyms start with an A. In their Reinventing Knowledge chapter on monasteries and convents, Ian McNeely and Lisa Wolverton mention findability techniques developed following the invention of the page, including alphabetical order (p. 91). David Weinberger, in Everything Is Miscellaneous, also discusses the development of alphabetical order in the Middle Ages. He points out that it took a long time tocatch on because, in his opinion, it was “conceptually confusing.” To prove his point about confusion, he quotes alphabetizing instructions from 1286, which apart from the funny spelling, are actually quite clear (pp. 26-27). Weinberger is correct, however, that alphabetical order took centuries to be accepted, but he is wrong about the reason. It was not too confusing, it was too easy. According to Mary and Richard Rouse in their article “Statim invenire: Schools, Preachers, and New Attitudes to the Page,”* the alphabet is an artificial method of ordering as opposed to a rational method. This distinction can be seen in glosses, reference works that explained details of the Bible without biblical interpretation. These glosses eventually evolved into glossaries. Information in early glosses appeared in the same order that it appeared in the Bible or other religious books. This is called a rational order. Even indexes were arranged in the same order as the book being indexed. To find something, you had to already know what page it was on. Rouse & Rouse indicate these early finding devices were meant to reflect the concept that the “universe is a harmonious whole” (p. 202). So the primary concern of arrangement was to promote philosophy not to find information. That changed when authors of religious books needed streamlined access to information. As preachers, they started alphabetizing material called distinction collections to help them prepare weekly, or in 1200 perhaps daily, sermons. Alphabetical order is an artificial method because it has no purpose other than to arrange information. It does not reflect how the book is organized. It does not reflect a philosophical theory. It just puts material into a simple, easy to understand structure. The preachers apologized for using alphabetical order, but they went ahead and developed the method because they needed to find information fast. The controversy over alphabetical order continues today. An information architecture discussion list recently had a lively exchange about popularity ranking vs. the alphabet. One person preferred popularity because it was felt that alphabetical order is essentially random. The respondent here was confusing an artificial arrangement with a complete lack of order. More interesting, however, is the assumption that a rational order with unknown values, such as popularity, is preferable to an artificial order with known values, such as the alphabet. We pretty much all know the alphabet, but if you look at a list of items arranged by popularity, you can only guess at individual placement. Function determines the form of an arrangement. Popularity and the alphabet serve different functions. There are many situations where popularity is the most valuable organizing choice. But if you just want to display information for fast location, those preachers in the Middle Ages developed a very easy method. * The Rouse and Rouse article is available as a chapter in their book Authentic Witnesses: Approaches to Medieval Texts and Manuscripts (1991) and in the conference proceedings Renaissance and Renewal in the Twelfth Century (Robert L. Benson and Giles Constable, eds., 1982). Am currently reading Brave New World. I arrived at Aldous Huxley’s 1932 novel first by thinking about the promotional spins we get so often from Web promoters. That led to Orwell’s Nineteen Eighty-Four Newspeak. When you think about Orwell you tend to think about Huxley. I’m only a few chapters in, but the novel addresses a question I have had for a long time concerning our emotional response to categorizing. Why do some people hate categories? After all, we categorize all the time. We filter every sight we see through categories. Walk down a street and you categorizeobjects as houses, trees, people. It’s an unconscious act that allows us to navigate our daily lives. This is a road; I can walk on it. This is a door; it is a subcategory of houseand I can open it. Almost every minute of our day is spent with categories, whether conscious or not. We even dream in categories. Yet the terms class, category and hierarchy are often expressed as pejoratives. Why is such a natural act as classifying so often vilified? I believe it is because these terms also express power relationships that control human beings. Life in Huxley’s new world features the extreme categorization of humans. All babies are essentially cloned. At their mechanical conception, each group of clones is designated as a class, Alphas on top and Epsilon-Minus Semi Morons on the bottom. Embryos of lower classes receive less oxygen. How are you feeling about the word class right now? We don’t like to classify human beings. Other classifications simply organize concepts. Animal taxonomy expresses one way of arranging biological characteristics into precise definitions. Canines have no power over dogs. Dogs are simply a type of canine, along with wolves and coyotes. One canine is no more important than the other. They share certain biological characteristics so we place them near each other in a class. We name their class canine and call the whole thing a hierarchy. In an org chart, a CEO does have power over a manager and we use the same word to express that power. Hierarchy has two meanings, one for placement based on characteristics and one for power. Like Huxley’s new world, we first experience a power hierarchy in infancy. Consider the org chart of a family. Hierarchy can be benign or ominous, but ominous always lurks in the background, even though when we open a door we are glad to know it is part of the hierarchy of a house. It tells us where we are going. Memorial Day honors those who died serving our country, but we may also visit a grandmother’s grave. Throughout the year, there are opportunities to keep her memory alive. One of the most distinctive is Burning Man, a festival for building and experiencing art in the desert, with or without clothing. Each September, Burners transform a flat empty playa near Gerlach into Black Rock City, Nevada’s third largest urban environment. After a week it disappears with the mantra, “Leave No Trace.” Nothing on the playa reveals Black Rock City’s existence until the next year. Climaxing the festival, a giant wooden Man burns the Saturday night before Labor Day in a bacchanalian rite of dance, performance art, and flames. I attended Burning Man for six years. I have also researched name arrangement on memorials, including the Memorial to the Missing of the Somme in Thiepval, France, designed by Edwin Lutyens. When I first saw a photo of the WWI Memorial, it reminded me of Burning Man. Thiepval was an influence on Maya Lin for her Vietnam Veterans Memorial. David Best may also have studied Lutyens before building the Temple of Tears, Temple of Joy and Temple of Honor. The Thiepval Memorial is a truncated tower with sixteen piers supporting intersected arches that increase in size for a two-story effect. In the interior, these piers hold names of 72,000 primarily British missing soldiers. Best’s Temples also featured arches, towers, multiple stories, and interior names. Constructed of scraps from manufacturing 3D dinosaur puzzles, similar to cookie dough scraps, they were feathery shrines of light and memory. Best’s first Temple at the 2000 Burning Man, Temple of the Mind, designed with Jack Haye, was a ramshackle building not reflecting Thiepval. But in 2001, Best and Haye got serious. Their Temple of Tears (or Temple of Memory) featured a truncated tower and two arches, one on top of the other, giving the appearance of two stories. Burners wrote memorial inscriptions inside. Sunday night it made a glorious blaze of memories and dinosaur templates. In 2002, Best, with Haye, continued building upon his own work in addition to Lutyens. The Temple of Joy had the truncated tower, the multiple story effect, and interior names, but no arches. His Temple of Honor in 2003 brought the arches back, retaining the two-story idea, with an elongated tower. Temple of Stars, Best’s final Temple in 2004, reflected only his own work, with a single story, tall tower and no arches. As always, Burners inscribed their memories into the interior. Mark Grieve designed the Temples of Dreams in 2005 and the Temple of Hope in 2006 without reference to Lutyens. The Thiepval Memorial organizes names of the missing by regiments, rank and alphabetical order. Because British fighting units mustered into the Pals Battalions of their towns and neighborhoods, the Memorial keeps friends and relatives together. At Burning Man, the names are random, an ill advised organizational structure for memorials. Michael Arad, designer of the proposed World Trade Center Memorial, tried random. When surviving families vilified the suggestion as insulting, he reluctantly changed his easy-way-out random to a display that honors victims as friends and co-workers. But random at Burning Man is only an appearance. Burners each carefully select a place on the Temple for their memories. They choose that place for a reason. Perhaps it reminds them of their loved ones; perhaps it’s easy to get to or a challenge to reach. Each memory remains in its sacred space until the burn on Sunday night. Some say the Temple is a superior burn to the Man. After all, the Man always looks the same, but the Temple changes each year. The burning of the Man is an invitation to party. The Temple burn glows with memories and the reverence is real, regardless of what Burners wear or do not wear. This year the Man is green, an obvious 2007 theme for a festival that leaves no trace. Check it out. You don’t need clothes, although costumes are a big part of the experience. Bring a tent, a shade structure, and lots of sunscreen and water. Bring those who now live only in your heart. When the Temple burns, it will carry your love into the sky.